↑ Yau, KW (1976). 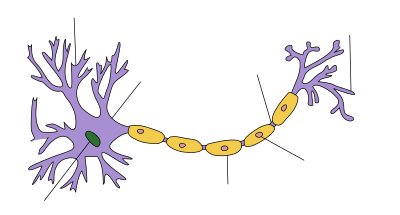 "Receptive fields, geometry and conduction block of sensory neurons in the CNS of the leech". J. Physiol. Lond. 263 (3): 513–538. doi:10.1113/jphysiol.1976.sp011643. PMC 1307715. PMID 1018277. ↑ Hess, A; Young, JZ (1952-11-20). "The nodes of Ranvier". Proceedings of the Royal Society. Series B. 140 (900): 301–320. doi:10.1098/rspb.1952.0063. JSTOR 82721. PMID 13003931. ↑ Lamoureux, P; Ruthel, G; Buxbaum, RE; Heidemann, SR (2002-11-11). "Mechanical tension can specify axonal fate in hippocampal neurons". The Journal of Cell Biology. 159 (3): 499–508. doi:10.1083/jcb.200207174. PMC 2173080. PMID 12417580. ↑ Finger, Stanley (1994). 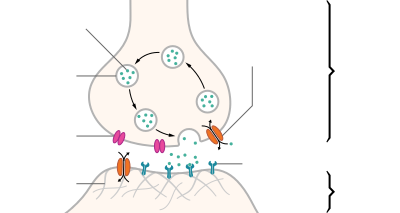 Origins of neuroscience : a history of explorations into brain function. Oxford University Press. p. 47. ISBN 9780195146943. OCLC 27151391. 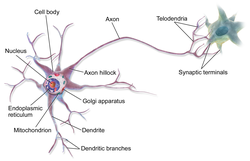 Kölliker would give the "axon" its name in 1896. ↑ Andrew, B. L.; Part, N. J. (1972). "Properties of fast and slow motor units in hind limb and tail muscles of the rat". Q J Exp Physiol Cogn Med Sci. 57 (2): 213–225. PMID 4482075. ↑ Russell, N. J. (1980). "Axonal conduction velocity changes following muscle tenotomy or deafferentation during development in the rat". J Physiol. 298: 347–360. PMC 1279120. PMID 7359413. ↑ Pocock, Gillian; และคณะ (2004). Human Physiology (Second ed.). New York: Oxford University Press. pp. 187–189. ISBN 0-19-858527-6. หน้านี้แก้ไขล่าสุดเมื่อวันที่ 26 มกราคม 2561 เวลา 12:28 น.